Small Dog Travel? Why Not? For dog lovers, a family holiday often includes the four-legged members of the family as well. For those who do not regularly holiday with their dog, a little extra planning is required to ensure that the whole trip is successful, stress-free and most importantly enjoyable for all. However, often when hectic holiday preparation is underway it is easy to forget those little things that will make sure your dog feels prepared and comfortable for their onward journey. Here is an excellent infographic provided by our friends at Principal, outlining the necessary items to pack to make your trip less stressful for your dog and more enjoyable for yourself. If your dog is unfamiliar with being in the car, then a few short drives are an excellent way to familiarise your dog with this new sensation, without overwhelming them. Planning when your dog will have their pre-travel meal should also ensure that travel sickness does not have undesired consequences when you final hit the road. If your dog is prone to car sickness, ask your vet for medication to relieve nausea and vomiting should it occur. Always pack plenty of cleaning supplies, just in case. A safe dog is a happy dog, so consider ways that you can accommodate your dog safely in the car. Will he be riding in a carrier? A car seat? Loose in the back seat? Just like humans, a dog is safest when he is secured in a way that prevents him from moving around while a car is in motion. Not only is this dangerous to him, but also to the driver. This is also why many dogs get sick while on the road. If you will be going to a large city location and your dog has only experienced rolling hills and green pastures, you will want to acclimate them to walking in the city. Traffic noises, pedestrians, sirens, and unusual smells can stress your country dog to his limit. Take frequent walks near traffic to get your dog used to these loud noises. Find locations where there will be people walking or waiting and other dogs on leashes. If this is a new experience for your four-legged friend, plan several outings so he can become comfortable in this type of setting. If your little dog is flying with you in the cabin, find a comfortable soft carrier and have him get used to staying in it without fussing. 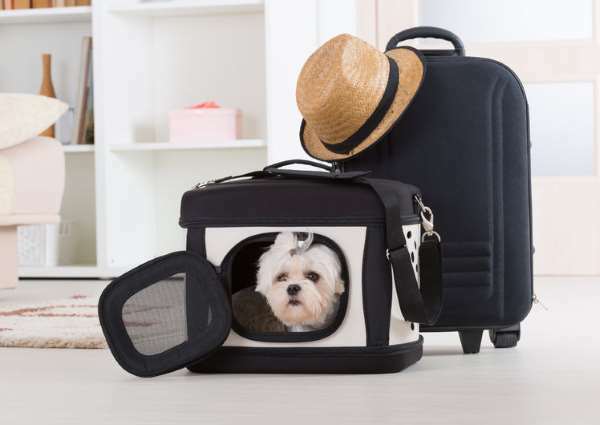 Your dog will be at your foot, but won’t be allowed out of the carrier, so you want to assure that flying will be fun and not stressful for both of you. If you are in the US, there are a few hotel chains that will accept dogs. Always check ahead of time for specific requirements. In recent years the U.S. has adopted many of the European practices that go along with being Pet-Friendly. Some hotels have size restrictions, and others require a pet deposit. Deposits can be quite costly ranging from $25 to over $200. Many will have limits on where the pet can go on the premises. Many are much more pet-friendly and provide dog beds, homemade dog treats and even afternoon tea for you and your dog. Here is a list of hotel chains that are typically pet-friendly. Still, it is a good idea to get their pet policies before booking your room. Four Seasons Hotels and Resorts Not all are pet-friendly, but those that are, offer dog-friendly amenities such as dog beds, bowls and dog potty pads in the room. Kimpton is not a large chain in the US, but very pet-friendly. In-room dog beds and even a complimentary wine reception that encourages you to bring your pet. Stop by the concierge’s desk for a list of nearby pet-friendly parks and restaurants. Best Western is another sure bet for pet-friendly accommodations. They do charge a fee, but it is very easy to find one where you are headed. Ace Hotel only has five locations in the U.S. but caters primarily to dog owners. Red Roof Inn has 360 pet-friendly facilities, and best of all, they don’t charge a fee. You won’t find those special dog amenities provided by more upscale hotels, but they are friendly to pets and for the cost conscious dog owner a sure bet. Motel 6 Hotels are among the most affordable in the U.S., but there are some restrictions including the limit of two dogs per room. Some charge a fee and others do not. Rooms are basic, but you can’t beat the price. Drury Inns boast 130 facilities in 20 states mainly in the South and Midwest. They allow 2 pets per room, and some have a weight restriction, so it’s best to understand their guidelines before booking. They charge a pet fee, but their other services such as breakfast, beverages and hot appetizers and wifi are all free. Marriott Hotels including Residence Inns, Fairfield Inns, and others have a total of 1632 locations in the U.S. Some have weight and breed limits and some charge a pet fee, but the beautiful thing is that they are located in all 50 states and the District of Columbia. Before checking your small dog into a boarding facility or hiring a pet nanny, consider another option: Small Dog Travel. Your pet may very well be thrilled with your decision and you won't need to worry about the care your dog is receiving while you are on holiday.